The Nyack College Running Warrior 5K Race & 3K Walk takes place on the Rockland County campus during Homecoming Weekend on Saturday, October 13. 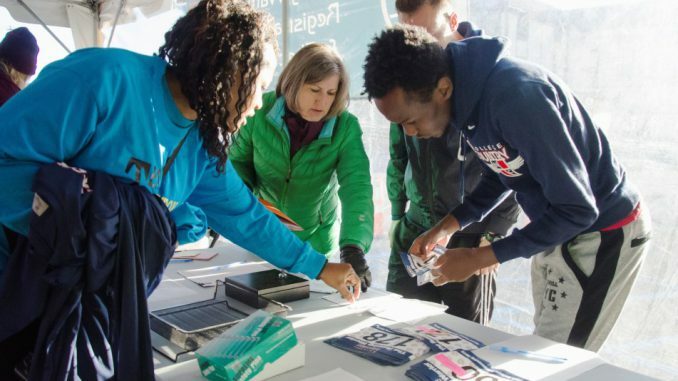 This long-standing tradition, which benefits the College’s cross country teams, has been successfully managed by Athletic Department coaches in the past. Today the event’s rise in popularity can be credited to the phenomenal work of College Relations Manager of Special Events Nancy Gates (pictured above in green jacket). Under her administration of “the Running Warrior,” it is now USA Track & Field (USATF)-certified and professionally timed by the three-decade-old company, CompuScore. Runners and walkers (parents with babies in tow, too) are welcome to check in between 7:30 AM and 8:30 AM in the Moseley Parking Lot before the pre-race ceremony. The race starts at 9:00 AM and an awards ceremony is held at 10AM. Register online and get more details about the course, fees and the award categories.